Levi (gray), getting some scratches and snuggles from Budweiser (bay). Most every year at the ranch, there are new faces to be found in the corral. This winter, we are introducing fifteen new horses in to our herd in hopes of them becoming part of our beloved furry family! Accept saddle bags and slickers. Getting used to slickers is important because, as everyone who has ridden in the west knows, weather can come out of nowhere, anytime! Guests use saddle bags to pack their lunches for all-day rides, so being used to those is vital too. Since all of our wranglers ride with both saddle bags and slickers, new horses get comfortable with both quickly. Riding in groups. We always make sure our horses are comfortable going out in groups, and that they don’t get grouchy with the other horses. They have to have manners, too! Manners. Speaking of manners, it is so important for our horses to have good manners not only with each other, but with guests as well, both on the ground and in the saddle. They can’t be pushy (which is why we don’t really hand feed our horses treats), and they need to stand quietly while being mounted and after. We spend quite a bit of time with them on the ground packing saddle bags, tying and untying jackets and slickers, brushing and saddling, etc. so that good manners become a habit. Trail exposure. 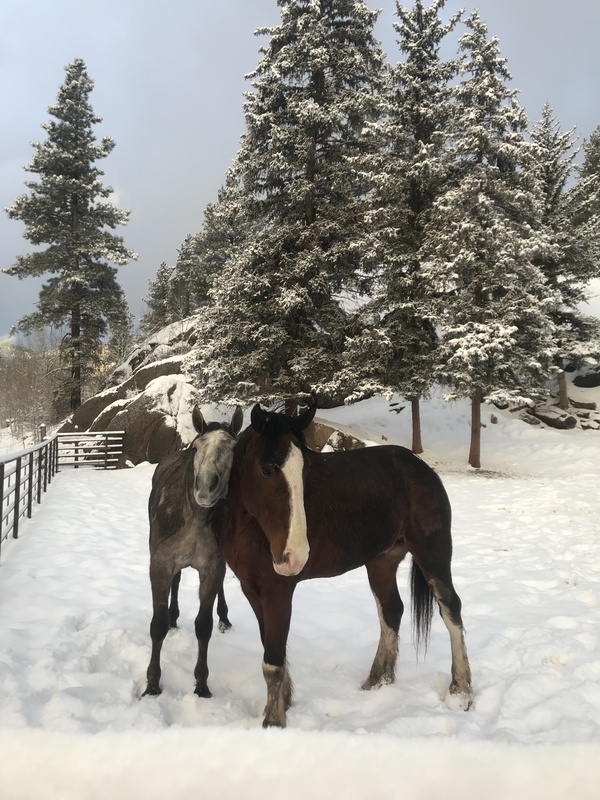 As I mentioned earlier, many of our new horses are from places other than the Rocky Mountain states, and therefore they might not have ever seen, let alone climbed mountains, or crossed rivers, stepped over logs, or been around elk and deer and other wildlife we have around here. So even if they pass the other three qualifications, we still have to make sure they are ready for anything they might encounter out on our trail rides. Carhartt (bay), behind is Levi (gray), and Denim (gray), all saying hello. There is more to what we ask of our horses, but these are our top four. If horses meet these, we can often find the right niche for that horse in our string. We are very picky about our horses, and of course, there are occasions that horses don’t work out. However, we will do our best to find them a home where they will be happy doing a different kind of job. 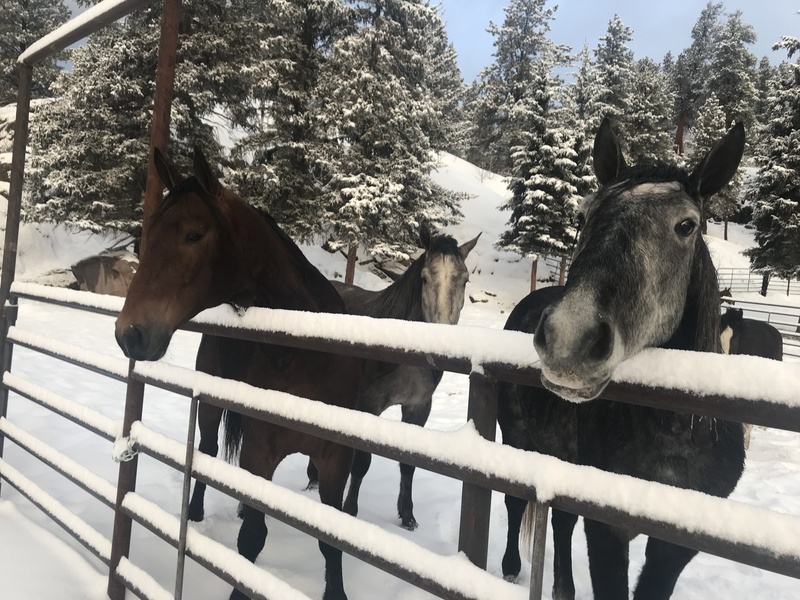 Just because they don’t work for us doesn’t mean that they are not nice horses; it just takes a little time sometimes to find the right fit, it just might not Rainbow Trout Ranch. But most of the time, it is. We’ve found that often, as long as we give them time, they figure out that this is a pretty great life! We are so blessed to have horses that can take care of new riders and children, and horses that can be fun for riders who have ridden before at different levels. We love our horses!